I just obtained a copy of this and hope to start it this weekend. 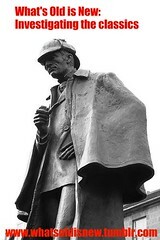 I’ve been a fan of Sherlock Holmes since I can remember so I’m very excited about this one! I’ve seen this title flying around on Twitter for some time; will definitely have to check it out! I love dual storylines like that, so I’ll have to give this one a try. This is a great review, Jen. Stuck a chord with me today. Oooh, want! Can’t wait to hear WOIN with Moore! Wow. That sounds amazing! I wonder about the audio…..
I’ve only listened to the Audible sample, but the narrator sounds great. I cannot wait until my Audible credits renew so I can pick this one up. I think I’m going to love this! I am so intrigued by this book and am really looking forward to reading it! Glad to see a good review for this one. I picked it up at BEA too, and I know Entertainment Weekly liked it – they put it on their Must List. Sadly I left the book back home. Thanks for posting. This is on my list. Glad you can recommend it. This is on my to buy list. I’ve heard nothing but fantastic things! I didn’t really have a desire to read this book until reading your review. Sounds wonderful. And I totally get the chapter length point. All of those tweets got me interested and now your review has me sold on this book! I seem to remember seeing you talk about this book on Twitter – I’m glad to know that it really is awesome. It definitely sounds like one I’ll be interested in! I can’t wait to read this book after hearing you talk about it. It’s on my Christmas wishlist!